Miriya's 1:100 Scale VF-1J comes equipped with a Super Veritech pack. Fully articulated action figure can convert into 3 modes: Fighter, Guardian, or Battloid. Includes forearm armor, leg armor, missile clusters, thruster packs, a gunpod weapon accessory, and an adjustable display stand! 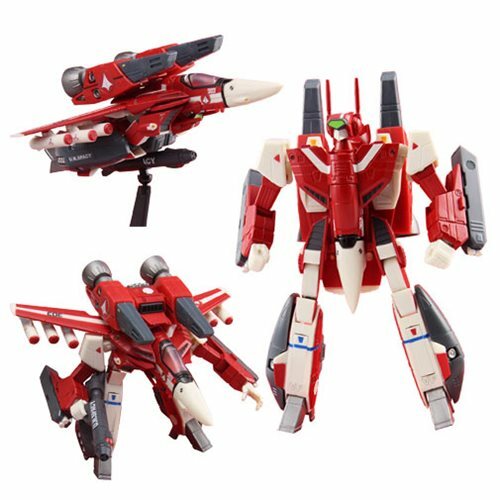 This Robotech Miriya's 1:100 Scale VF-1J Super Veritech Action Figure comes equipped with a Super Veritech pack. The impressive figure stands approximately 6-inches tall, is fully articulated, and can convert into 3 modes: Fighter, Guardian, or Battloid. Fans will enjoy the bonus armor pack that contains forearm armor, leg armor, missile clusters, and thruster packs. For maximum versatility, the Robotech Miriya's 1:100 Scale VF-1J Super Veritech Action Figure also comes with a gunpod weapon accessory and an adjustable display stand. Ages 14 and up.